Spay/Neuter for feral kitties through Project Purr is currently FREE for Santa Cruz County residents (see below for clinic information). 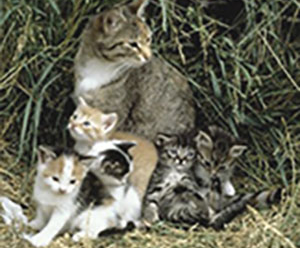 For over 30 years, Project Purr has provided a spay/neuter veterinary package for feral cats/kittens to all residents of Santa Cruz County, regardless of income. Cats must be at least 4 months old or weigh at least 4 pounds. The package includes: spay/neuter, FVRCP and Rabies vaccines, parasite control, mandatory ear tip (humane surgical removal of the left ear tip as a sign that the cat is fixed). All cats must be delivered to the clinics in humane traps. Traps can be obtained (with returnable deposit) from Santa Cruz County Animal Services in either Santa Cruz or Watsonville. We recommend these trapping tips from the San Diego Feral Cat Coalition. Do you work in Watsonville? Friends of Watsonville Animal Shelter (FOWAS) has a Feral Cat Voucher Program: unlimited free feral cat spay/neuter/TNR for businesses in Watsonville/Freedom. Call 831-454-7200 for more info. Aquí es spay neutro información en español. Please call 831-475-0432 BEFORE trapping to schedule an appointment (NO weekend surgeries). If you are unsuccessful trapping, please call to let them know, and reschedule. Drop off cats in individual traps between 7:30-8:30am before regular clinic is open, Monday-Friday ONLY. Pick up before 6pm on the same day. Surgeries 7 days/week, no appointment necessary, proof of Santa Cruz County residency required. Cats need to arrive in traps before 10am to guarantee same-day surgery and avoid overnight boarding charges, and need to be picked up by closing. Aftercare: keep kitty in a covered trap in a safe location overnight, release the next morning, feed as usual (kitty may disappear for a few days). You can trap and spay her if the kittens are old enough to eat on their own (you can trap the kittens if they are big enough to alter, or trap/tame and fix later). Cats that are pregnant can also be spayed. I found really tiny kittens! If the kittens are not in immediate danger, wait to see if the mother returns. If the kittens are orphans, they will need bottle feeding until weaning age, as in this orphan kitten, fostering and weaning information from the San Diego Feral Cat Coalition. If you bring the kittens to a shelter, they will be euthanized if a foster home is not available.